Wahoo! 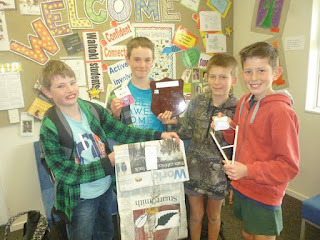 Congratulations to our twelve Year 7 and 8 students who participated in the North Harbour School's Technology Challenge for 2015 at Orewa College today. All students demonstrated Manaaki (respect for themselves, others and environment) with our Year 7 team winning the overall trophy - tu meke! Check out our amazing teamwork . . .
Our arctic sleigh races . . .